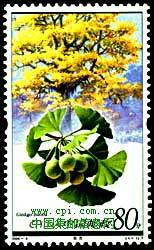 Ginkgo biloba 'Majestic Butterflies' can you tell me about this plant or send me to a site that might? Any pictures out there? * Many links added about paleobotany on my Links-page. * Added new page: Ginkgo fossils with many pictures and much more. My name is Tomas James from Argentina. I have just finished building my house and there is a Ginkgo that i had planted 6 years ago, is about 3 meters high and is at about 1 meter from the house. Is it ok to have it so close to the house? If I have to move it, what will be the minimum distance from the house that shall I plant it? I recently purchased a G. biloba "ding-a-ling" but I can't find any information at it, i.e., mature size, shape, growth, etc. Where might I find such details? Topic sent by Walt Sigman. Hoboken isn’t exactly a town known for its trees. In a town of 40,000 people crammed into one square mile of century-old tenement buildings directly across the Hudson River from Manhattan, there isn’t much room for them. Yet the town planted 40 trees in its Pier A Park as a living memorial to those who died on 9/11. These trees aren’t ordinary oaks or maples or London plane trees that already occupy Pier A. These trees are special—they’re Ginkgo bilobas. 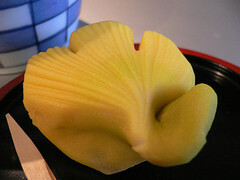 A Japanese sweet in the form of a Ginkgo leaf. Sweets, or wagashi, unique to Japanese cooking, are intended to accompany tea, rather than to follow a meal. I found this photo here. * New photo photospecial page: Ginkgo pollen on male tree in early spring.